Representative of the artist’s aspirations and anxieties after Master’s study, ‘Through the Banisters’ pictures a young woman, dressed in a ball gown, floating down an ornate staircase, reminiscent of a scene from a Hollywood movie. 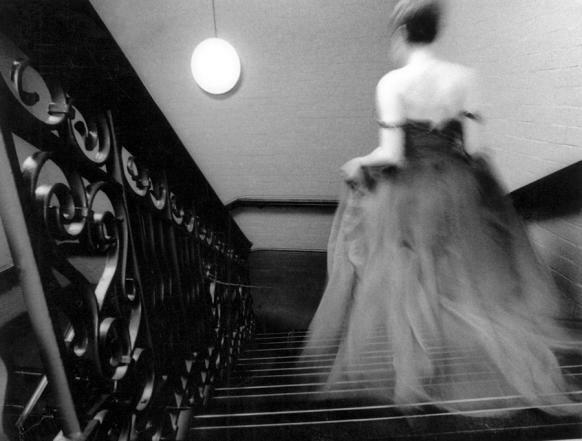 In this sequence of nine ‘film stills’, we are invited to watch this Cinderella like figure as she descends the stairs, only to pause for a moment, appearing deeply distressed and ‘caught’ in the centre of the web-like ornamental banister. Whilst her self-absorbed, dreamlike dance signifies a magical escapism into another world, the symbolic confines of her surrounding environment result in her literal, as well as mental collapse on the stairs. ‘Butterfly’, the shorter sequence of three photographs that accompanies this series, is suggestive of the lone woman’s mental visualisations during her contemplative dance on the stairwell. Transported to an empty room, she resumes her dance again, but this time silhouetted in front of a window, appearing like a ghostly presence, or indeed like a butterfly, unable to escape.